I found it very interesting that one of the topics of conversation once the USMNT exited from the 2018 World Cup was the role of “pay-to-play” in youth soccer. When my eldest began travel soccer nine years ago, he was playing U9, the coach was a volunteer and we went to one away tournament: Hempfield. Our cost: $450. By the time he finished travel soccer at U16, the coach was earning $10,000, we were training year round and going to one away tournament: Bethesda. Our cost: $1,700. As many of you know, my son gave up soccer for the theater this past year. I do not begrudge the money we spent on soccer — he loved it and we loved watching him — but we spent about $10,000 when all was said and done for him to have fun playing soccer. How many families can do that easily? It definitely wasn’t for our family. 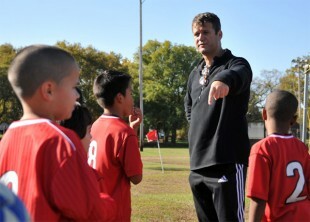 The biggest change that I have seen in our club over the past 9 years is the shift from “Dad” coaches to paid coaches. That is in large part why the average cost for a player in our club (U8 – U19) is $,1500, which is true whether you play for an A, B or C team. Full disclosure: My husband was a volunteer coach for five years for our eldest son before he moved to the A team. Now my husband is a paid assistant for my younger son’s age group because both of the coaches are college coaches and miss games/practice occasionally. No, he doesn’t make $10,000, just enough to help cover the costs of our son’s travel fees. Now I have to say, I’m a little on the fence about this paid coach thing. While I see the merit in having paid coaches, especially for the higher level teams, I also wonder about the cost to the families. Some may say you get a better quality coach if you have a paid coach. To that, I say I’ve seen a few that weren’t. There are paid coaches that I would refuse to let my son play for, and I’ve also seen a few volunteer coaches who were in way over their heads. There are pros and cons to both situations. I wonder, really, are there that many kids out there who are playing at a level that they need to pay coaches 10 15 thousand dollars a year? I look at high school coaches. My husband has been doing that for a few years. They make a lot less, maybe a couple thousand. You can say that they don’t spend as much time with their players. I have to disagree. My husband trains five days a week, sometimes twice a day starting the second week in August until the middle of October, unless the team makes the playoffs. On game days, it could be six hours between travel and both teams playing. He gets a break and then its back at it for indoor in January and then a spring/summer league. Many coaches I know don’t do it for the money, but for the love of the game. My husband spends hours planning training sessions, going over tactics and whatever else coaches do to prepare. He doesn’t get paid to do that, he chooses to do that. So that leads me back to the money. Why are we paying our travel coaches so much money? Are some of them worth it, you bet. I have a friend whose son is on the No. 1 team in the country. Great coaches can attract great players. For those teams, I can see paying a coach accordingly. For the rest of us, whose kids just want to play soccer, there has to be a middle ground. We are stuck between playing rec and paying for travel. I love when you write these articles. So important and worthwhile. After a hiatus and kicking of the rock away, I’m fresh and ready to argue again… for a respite. Any person who ever coaches at any level should be required to understand basic small sided game theory. Horst Wein pretty straightforward and easy —followed with a steady chaser of club lead KINS. This would be ideal and really cool in my “Utopia” of recreational soccer for all kids, cause then we would be certain each kid was learning how to properly problem solve and move to support teammates AND NOT dribble to penetrate… play sharks and minnows or just kick the ball as the primary method of technical development. …..that’s where the recreation and free play comes in- instead of the fields being dominated by travel this travel that tourney here tourney there, the local club could design a saturday around all day open play. These coaches should NOT be paid. Period. These coaches are providing a service to the community. They no less should be required to understand how to educate though. THEN… we have the academy which begins at 8 or 9 and these coaches should be paid. These players displaying a quality of play that elevates them above ALL the other players in the recreational setting. Each of these age groups should carry an A and a B team. THAT’s It. Each season should conclude with rec kids having an opportunity to earn advancement and A or B players having the right to earn relegation. It is simply that cut throat but built around community and recreation. Simple and brilliant. These Academy Coaches should be paid handsomely be required to pursue consistent education and be required to demonstrate the who and where or this consistent education… all while earning enough to pretty well live… save a bartending side gig maybe. $2500 times 18 kids in the A and B group is $45,000. A good start to making a good living as a paid professional coach. THEN… we would finally be able to destroy the scourge of american travel soccer which is TOTALLY complicit in holding back our communities and holding back our advancement. Travel soccer is NOTHING more than a business model. It simply must go away. now back to your regularly scheduled programming. Thank you. Staci. BTW in case it isn’t clear, the same coach coaches the A and B team and the competition between roster spots for the A team should be fierce every week. This should be NO different than the competition for roster spots displayed at the professional level… cause its the academy. The best players from these academy’s then matriculate to USDA Academy- which IMO should not begin until 12. A parent with solid communication skills is the team manager setting games to not overlap. A parent can serve as an assistant. I thought that Jonathan Tannenwald’s interview with Kevin Payne was very interesting. Especially compared to Staci’s thoughts. Parents are driving this ship called club soccer/pay to play. Parents are paying for this ship. If anything is going to change how the ship is steered, parents are going to have to change their expectations of where the ship is going and how it’s going to get there. Just a side note about the Kevin Payne interview. His comments about the cost to get a “A” or “B” coaching certification keeping good coaches away is telling. With $140 million in the USSF bank account, here is a concrete way to help development of good players in the US. Drop the cost of getting more certified coaches. Thank you, Staci. This is a discussion that should not end anytime soon, until there is a long-term viable solution in place. I am a coach, and I’m an unpaid volunteer, and I have no kids on the team I coach. I do it out of love for the sport, and because I see how much fun the kids have being out there. It is a CYO program, so the dynamics are obviously much different. But do I think I should be paid? Nope. I’m good. But I do think the positions can be incentivized in a way that you hinted at: if you coach and you have kids, your kids play free. Yes, there are pitfalls with that, as well. But it will promote more parents to get involved, which *should* be a good thing (we have all experienced time when it is not). I completely agree with Pachy’s view towards Recreational leagues. We should have many more recreational leagues than the pay-for-play leagues. A VAST majority of these kids are not going to get scholarships, let alone play in college. So why are you dropping a mortgage payment on these experiences when you can have a comparable experience for a fraction of the cost? You can also have organizers scouting the Rec leagues to pull together “all-star” travel teams. This would limit the ridiculous traveling, as well as the unnecessary costs to parents of kids who just want to have fun, not practice to be a pro when it won’t happen no matter how much they practice or have special trainers. Again, I’m sure we’ve all seen these kids and their parents. There needs to be a greater acceptance of Recreational Leagues. Plenty of kids just want to play. Let them play, let them experiment with the game and their skills. If done correctly, organizers/scouts will be able to identify the talents in those pools. As someone in his first year coaching with my son (U6) I haven’t yet met the horrors of travel soccer up close, but man it all seems so backwards. We force kids into spending more time on soccer if they want to play but then only take is so far because there’s not enough interest to take it too far. And the prices are just stupid. And constant Tournaments are just stupid. We did 1 or 2 tournaments a year when I was playing and that made them fun, but every weekend, what’s the point. We are basically in a limbo state where the kids who just want to play local for fun don’t have great options and the kids who want more development are getting short changed. The whole thing is broken. I really love these articles. I’m a new first time dad to a little newborn son. My real playing career ended with travel at age 17 and then picked up Sunday league play about 5-6 years ago at age 25. I’ve always wanted to coach and looked forward to watching and coaching my kids. It’s articles like these, as well as conversations with friends and coworkers who have kids actively in the system, that really causes worry. What path do I take my son on eventually? Will the coaching not skill level be so advanced when my son is at the age to play that I will have been too far removed to be capable of coaching? How do I know which local team or coach to go with? The questions go on and on. My only hope is that the current model seems to be pointing towards change and that change will hopefully be to the positive. Thank you again for your experiences and opinions as they are great insight to others on the site. Once you have a 7 or 8 year old you simply have to recommend they play the ball in one touch wherever possible and receive the ball across the body with both feet (it will be an absolute mess for a while but the kids will adjust if you are consistent with the message), which for some unearthly reason is frowned on in American soccer. .
We are terrified of kids kicking it (which parents yell for them to do shamefully) and punish the whole group instead of the few kids who need to be remediated that KINS. ….First he must scan. Then he must align his body correctly. Then he must look into the future. Then he must play the pass… quite simply the birth of IQ and intelligent decision making. In most other places footy is a passing game first and a dribbling game second. Here we have is Bass-Ackwards and it stunts the IQ necessary off ball movement growth of our players. READ. DECIDE. PLAY. not the other way around. Simply put you will do right by your kid and your kid’s buddies. Settle on 3-5 activities and work them again and again and again. Horst will show you the way. Another public service announcement. Carry on. Almost all of my drills are 2 or 3-touch drills, at a max. During small-sided scrimmages I will allow them 2-minute windows of unlimited touches to allow them to have some fun with individual moves, but the majority of the time is ball movement, and player movement. Read the field. If you don’t have the ball, get to a spot where you can receive it – don’t hide behind defenders. If you have the ball, look for the cutters or the simple open man. Keep the game simple, and the game will stay simple and fun. My son is 3yrs old and we just started soccer in Sept. He goes twice a week for 1 hour each day, which is about 15 mins longer than the attention span of any of the kids. In these weeks he has had four different coaches that rotate through and some are great with the kids, others have no idea how to speak to toddlers. After reading these articles, I’m not sure how to feel going forward for him. He likes it and he’s pretty good compared to the other kids but while this session is only $100, looking at future costs is giving me pause. As I read this, I wonder if $100 for 8 weeks of soccer at age 3 is a good price or outrageous, I’m not sure. My 5-year old is playing in a league that cost us $65. They have 2 1-hour sessions each week. The first 30 minutes is a (chaotic) practice, followed by a 30-minute game. The kids love it, and they have the ball at their feet twice each week. The coaches are just parent volunteers, so I don’t know if that is part of cost variance, but $100 seems pretty high for kids that young. If that’s the starting point, I’d do some research about the costs as they get older. Soccer Starts at Home. Tom Byers. a kid that age doesn’t really need any organized settings. the book will give you all the info you need to help him get a serious head start… all while saving the ridiculous $100. I agree with what most of what you write on here, but I do dispute the notion parents that have to find a good A team for their youngest kids. Kids don’t grow, develop and improve in a linear fashion starting at age 7, so I would suggest parents find the right club – regardless of whether their kid starts on the A, B, C or D team – for their kid’s and their own needs. I had 2 kids play travel on A-teams and spent a lot of money on travel fees. 1 boy played all 4 years in College and 1 is currently playing in College. Key key issue: have a great Team Manager (1 of the parents) who controls cost by negotiating with the coach, getting the best coach for a reasonable salary, monitors the budget, decides how many sponsored (city) players one can have, makes sure all parents are happy with the fees and number of type of tournaments, etc. Not having a great team Manager should be reason to switch teams. After looking back on spending all that money, it was all worth it: the boys have/had so much fun playing travel and in College, and have become great leaders and great gentlemen. I also enjoy watching all their College games either live or on the web, and am getting some money back in terms of Grants. Choosing a travel team is like choosing a College and a degree: how much you pay for that (or go in debt for) also does not make a lot of sense if you only get a misery salary afterwards; you may as well have gone to a Trade school. A lot of people forget to chose the College, Degree and the friends they make in College wisely. I think the big issue that we are all dancing around here is that not everyone can afford to do this. $2000/year can be A TON of money to some families. So the questions really are: why is it so expensive, and does it have to be that expensive? I have heard other people say “it was completely worth it. It was a fantastic experience.” My response, so is backpacking across Europe…another thing that a lot of people can’t afford. This is where soccer falls down in the US. And it’s the major criticism of pay-for-play. I don’t begrudge anyone the experiences, but you have to be cognisant to the fact that a large percentage of the American public is not able to join due to the cost. We always had 3 players who did not pay a penny. They were subsidized by the others. This was a usual thing at FC Delco and LMSC. By contacting these clubs and asking them how many volunteers they have, etc. one can find cheaper solutions. Should it be subsidized with US Soccer funds: for sure, since they have tons of money just sitting there. When I was a student I drove a yellow cab in the city at night time from 6 to 6 to ski in Europe. If there is a will there is a way! The pay to play system in youth soccer has become very similar to our dysfunctional health care system: too many people make too much money so there is no incentive to reform it. I always find your posts interesting, even if my soccer parenting experiences and views do not always align with yours. I found it interesting you referenced a friend’s son being on the “No. 1 team in the country”. By what measure are they #1? Did they win the National Championship in their age group or are they ranked #1 by gotsoccer.com? If it’s the latter, I would say such a ranking is at the core of what’s making youth soccer so expensive today. Teams are trying to win an arbitrary top ranking, promoted by gotsoccer to get teams to pay four figures to attend gotsoccer tournaments…and when they attend the tournaments, they must stay at hotels sanctioned by the tournaments. One step for reducing costs, especially prior to U16*, is for teams to stop chasing gotsoccer points and spend their time staying closer to home working on player development. The #1 ranked team should be the National Champion in any age group. * At U16 and beyond, it is important for teams to attend showcases to get the players in front of college scouts. Yes to Gotsoccer and Amen. Our club sets the fees and basically tells us how many tournaments to go to. There is no salary negotiating. We are told this is how much it costs and this is what you get. Team managers have zero input. One might complain about the cost of paid coaches but a great coach needs to make a livable wage. If your son or daughter wants to learn the game in depth from a knowledgeable coach there should be a cost associated with it. The European models have paid coaches, just the funds come from different sources. Travel is not necessary for everyone. The in-house option is in expensive and it worked for my oldest son. CYO is an affordable option. My younger son loves the sport so we opted for travel. I can’t coach but I am the Team Manager which gives mes insight to the fees and cost controls. With that said, I think it is important to ensure the coach is adequately compensated.